In other words, the company, which was founded by Niklas Zennstrom and Janus Friis of Skype fame, has conceded that ad-revenue alone can’t pay the bills and, instead, hopes that Old Media will. Interestingly, on the same day as Joost’s announced change it direction, it’s been reported that rival Hulu alone boasts 10 percent of the online video ad market. We already knew that sometime in 2009 Joost would run low on cash – CEO Mike Volpi said as much last December – and now five months on the Internet TV service is shopping around for a buyer, reports CNet. Having already re-invented itself once, ditching its P2P desktop application in favor of a browser-based site powered by Flash video (just like everybody else), the company, founded by Niklas Zennstrom and Janus Friis of Skype fame, is trying once again. This time Joost is positioning itself an ideal platform for powering the Internet TV ambitions of a cable or satellite company, according to the report. Time Warner are said to be the only party interested so far, although both companies have refused to comment. It’s about time. Joost, last year’s “It” online video startup, has cast aside its desktop-only client in favor of a browser-based experience. According to Om Malik, Joost will release a small plug-in that will embed itself in a browser to allow viewers to grab files using peer-to-peer technologies. The new browser-based video player is said to provide better quality than average video sites. Since the story broke earlier today, NewTeeVee’s Liz Gannes has had a chance to poke around new.joost.com, which is password protected. (It will not be available to beta testers for about two weeks.) In the meantime, NewTeeVee, News.com, and TechCrunch all have screenshots and/or video of New and Improved Joost in action. While the early, early reviews are mostly favorable — videos start playing in a few seconds, they scale nicely for full-screen viewing — it’s hard to work up any excitement for New Joost, which seems like another version of Hulu, the online streaming video joint venture from NBC and Fox. Unlike Hulu, however, New Joost suffers from a lack of prime content. Without it, why even bother with Joost? A new version of Joost, the much hyped p2p Internet TV service from the founders of Skype, that will run in a Web browser is just weeks away, says CEO Mike Volpi in an interview with Silicon Alley Insider published today. When Joost was first conceived of in 2006 it was pitched as the antidote to YouTube: an Internet TV service geared towards major content owners who required guarantees around copyright protection, and providing viewers with a higher quality “TV-like” experience. However, since then the online video landscape has changed dramatically, with many competitors syndicating professionally produced and network TV content online, on a mostly non-exclusive basis. 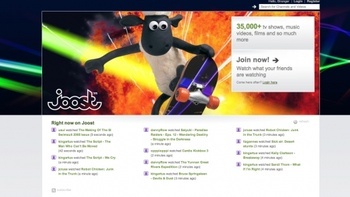 And unlike the current version of Joost, the majority of competing services, such as Hulu, run in the browser and don’t require a separate download. Viacom seems to have cooled on Joost; is it headed to the Deadpool? It looks as though the once high-and-mighty Joost is running out of juice. Joost, the peer-to-peer Internet TV service that once raised $45 million in 2006 from investors such as CBS, Viacom, and Sequoia Capital Index Ventures, is revamping its tech platform [last100] with a Web-based service that requires only a plug-in to play in browsers. It’s due sometime this summer. Currently Joost requires a downloaded desktop client to play peer-to-peer content. It works with Microsoft operating systems XP and Vista and Apple’s OS X (but Intel processors only). The Web plug-in is clearly a move to stay afloat and relative amid the success of an online streaming site like Hulu, but two of Joost’s biggest investors, CBS and Viacom, have little to say about the service these days. “We come at Joost or any other platforms from the point of view that we cannot predict — nor did we in that case or any other case — predict which ones are going to be hugely successful, moderately successful, which won’t work,” he said.